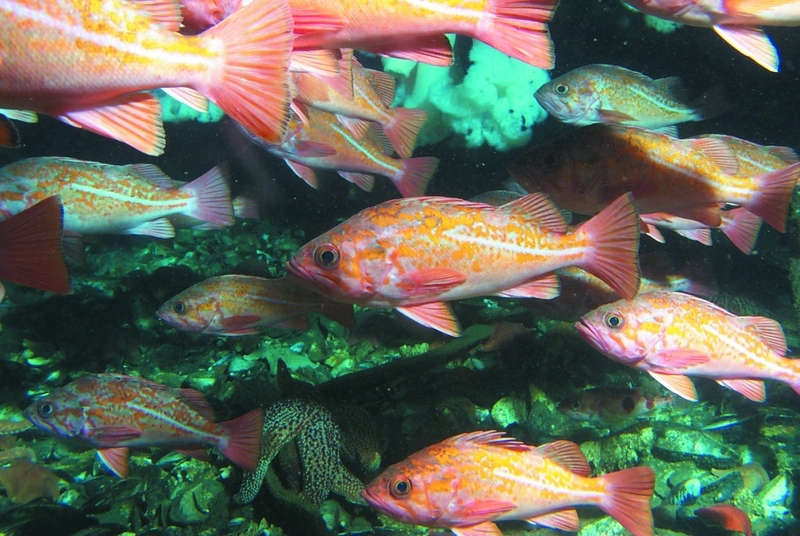 Platform Gilda is home to thousands of vermillion rockfish (Sebastes miniatus). Oil platforms off the Southern California coast are some of the world’s most productive marine fish habitats, according to a new study published today in the Proceedings of the National Academy of Sciences. The findings could have important policy implications for the decommissioning and construction of oil platforms, wind farms and other offshore structures. “Given the hundreds of thousands of fishes that sometimes live around these platforms, these results were not a complete surprise,” said Milton Love, a research biologist with UC Santa Barbara’s Marine Science Institute. Love and a team of marine biologists from Occidental College and the Bureau of Ocean Energy Management (BOEM) are the first to estimate rates of production for the entire community of fishes associated with oil platforms. The researchers then compared these rates to previous research that made similar measurements in highly productive estuary, coastal lagoon and coral reef ecosystems. Using up to 15 years of annual visual surveys of sea life at 16 platforms from Orange County to Point Conception conducted by Love and BOEM’s Ann Bull, the scientists developed a model to estimate fish production at each site. 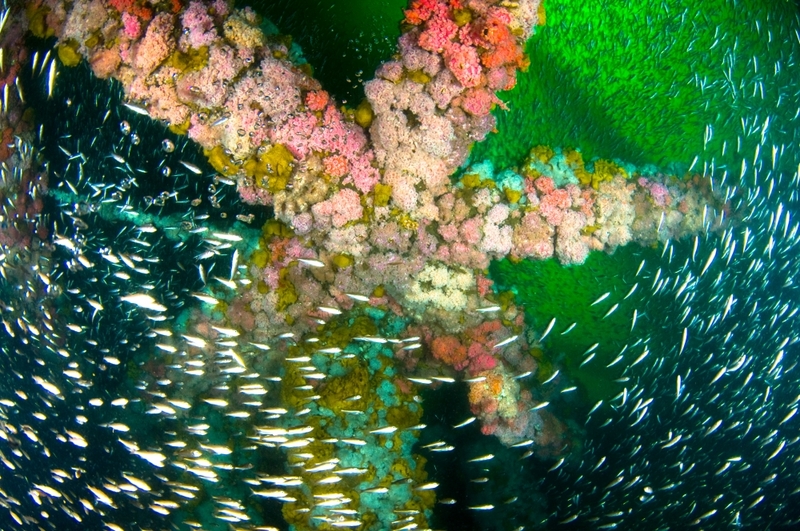 They found that the oil platforms tended to produce about 10 times more fish biomass (or weight) — chiefly various species of rockfish and lingcod — than other more conventional marine habitats studied in the Pacific and North Atlantic oceans, Mediterranean and North seas, the Gulf of Mexico and the coasts of South Africa and Australia. According to the investigators, when compared to the fish production on natural rocky reefs at similar depths off the Southern California coast, the platforms on average produced more than 27 times as much fish. The study’s results could potentially inform decisions to be made about the inevitable decommissioning of the world’s roughly 7,500 oil and gas platforms. Rather than the structures being completely removed, underwater portions could be left intact to provide habitat to supplement increasingly threatened fish populations on natural reefs. Next, the researchers hope to explore how individual platforms contribute to regional fish production in the Southern California Bight — the curved coastline from Point Conception to San Diego — and to better understand what makes one platform more productive than another. Such insights could then be used to create fish-friendly designs for other offshore structures. The current study was made possible by two factors: years of painstakingly gathered data on fish populations at Southern California platforms and detailed information about the biology of the individual species present. With documented rates of growth and mortality, researchers were able to estimate fish populations over time, expressed as grams per square meter per year. The study was funded with a $100,000 supplement from the BOEM, which regulates offshore drilling, and builds on a previous project funded by the California Ocean Science Trust.